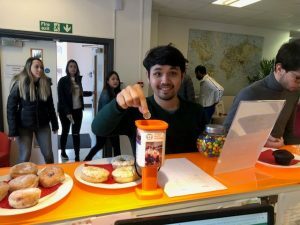 Last week at EC English Language School, Oxford we were very busy fundraising money for two very important charities; United World Schools and Crisis Oxford. United World Schools are a charity whose primary focus is ensuring that children in poor and remote areas of the world are given the opportunity to have an education. EC and UWS have been working together since 2016 to provide education, build schools and support teachers in rural parts of Cambodia. Currently there are 9 members of EC Staff in Cambodia who are helping to build a new school, train teachers and teach students. With just £1 donation, a child can be educated for a week! Crisis are a charity who support people out of homelessness for good. 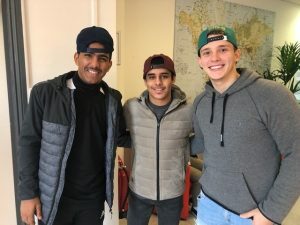 They do this by providing educating and training for them to get in to work, helping them find jobs and housing as well as campaigning for changes which help stops people becoming homeless in the first place. 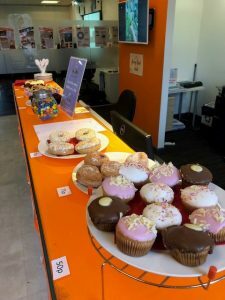 In true British style, we started off our fundraising extravaganza with a Bake Sale! There was a selection of delicious cakes, biscuits and pastries which sold out by lunch time.. No surprise there! The students and staff provided cakes, and some were even homemade! Thank you to all the students who contributed to the success of the bake sale. 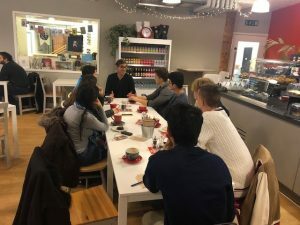 On Thursday we went to enjoy some tea and cake in the Crisis Skylight Café in Oxford. We learnt a lot about what the charity Crisis do to help people in danger of becoming homeless and where the money goes that is raised for the charity. It was very interesting to learn that with just £25 Crisis can provide healthcare and counselling to vulnerable people. How many M&M’s in the jar? 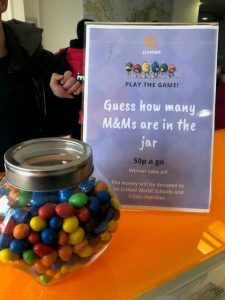 We also raised money by guessing how many M & Ms were in the jar. Students paid 50p to guess – there were some guesses that were very accurate and some were miles off. Can you guess how many there were? Panupat was our winner by guessing 300, he was very very close as the actual total was 302! On Friday students and teachers donated £1 to wear a hat to school, such a simple and fun way to raise money for a great cause! Thank you to everyone who contributed to the success of our giving back week – in total we raised £64.55!